Tapping into the wisdom of university educators takes four years and a lot of money. But the sage advice of one Professor Salt -- a fellow O.C. foodblogger who writes You Gonna Eat That -- comes free and easy, sans tuition fees or midterm exams. And instead of a degree, you get great tips on where to find good eats. One such tip of his that I had been putting off for far too long is The Filling Station; a joint in Old Towne Orange which, the Professor says, bakes "behemoth pies of incomparable flavor." And he wasn't the only one singing its praises either. Recent chatter on the Chowhound board told of family members disowning other family members who come back from The Filling Station pieless, and forewarned that it was "open season" on pre-orders. If you didn't know any better you'd think they were gabbing about Elmo TMX (no relation) or a PS3. But this ain't the latest toy craze. We're talking pie. Pumpkin pie. A pumpkin pie that people around these parts go nuts for every year around this time. About a week ago, we ordered a slice to share just to see what the hub-bub was all about. The wedge of pastry was heated, dusted with cinnamon, and served with several dollops of whipped cream. As soon as I tasted my first forkful, I understood. This was a true masterpiece in the art of baking. While fillings of lesser pies range from too pasty, or too slobbery, or too dry, this was perfectly set; firm to the touch and wiggly on the palate. With a fleeting presence on the tongue like the lightest of creme brulees, this pumpkin custard was a happy confluence on its roster of players: the emulsifying power of eggs, the earthy-sweetness of the gourd, and the warmth of cinnamon. The edges of the crust that held it all was rippled in repeating parabolic shapes, and was of a rigid construction although it looked as if it was sculpted in sand. It broke into brittle chunks under the pressure of my forktips and ate like a butter-rich shortbread cookie. The granulated coarseness of the crumbles was the perfect foil to the custard -- a study of contrasts between the sturdy and the delicate. This was autumn, distilled inside a pie pan. As we pinched the last pie pieces from our plate with our petty paws, we knew what we had to do: pre-order post-haste for a paltry $20. Sounds delicious! My mouth is watering! I grew up in Orange since 1976 and I've never even heard of this place. How long have they been there? I'm assuming they serve a good breakfast and lunch as well? My sister LOVES pumpkin pies, but I don't. Maybe I can convince her to come along with me, and maybe i'll finally start to like pumpkin pies after The Filling Station. I don't know if i can convince my parents though. They hate the texture and compare it to poop (not that they've eaten poop!). Elmo, thanks for the props. and I'm glad you undertand now. I recently heard they have a peach pie and a pecan, and I can't wait to try them both! Christine: The baked goods here are as luscious as Ashley Judd. The regular food menu? Wynonna. Love the holiday-themed post! Now I'm ready for Thanksgiving! Being bombarded with all the advertising of late for lesser, chain-restaurant pies, all I could think of was how Professor Salt must be savoring the thought of just ordering a Filling Station pie. Peach pie sounds great, too!! 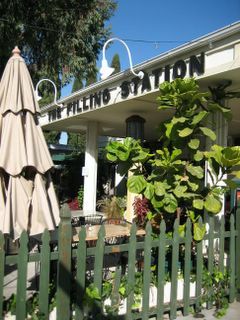 I think The Filling Station is probably not more than a few years old. Although the building the restaurant now occupies has been there for a long time, and at one time in its history it was a gasoline filling station. 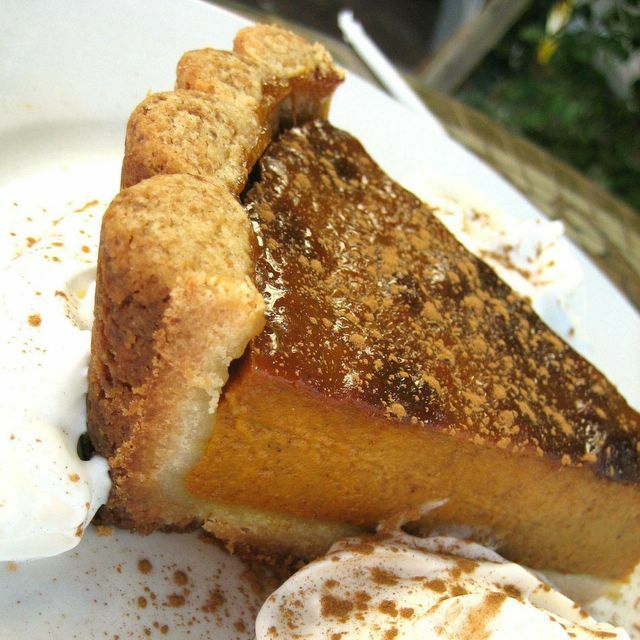 Although it's the best pumpkin pie I've ever tasted, I'm not sure how much they'd impress non-pumpkin pie eaters. No amount of cajoling can convince some Indonesians to eat turkey since turkeys look like buzzards to them (well they do look like buzzards actually, don't they). But hey, I think your sister will really love the pie, and I think you might too! Costco's doesn't even compare. And I like Costco's. "Say, that was some good pie wasn't it?!" "Yeah that was! A very good pie!" Although as far as their other items, I do not know. We came for the pie that day, and that was all we got. But judging by Professor Salt's apt analogy, the other menu items aren't Ashley Judd luscious. Thanks again for the reminder. I think this is the beginning of a new food obsession. On that note! Happy Thanksgiving! But I think a happier one is possible if you're lucky enough to secure one of these beauties. I know. I know. I've been slowly getting myself out there. Next trip there I'm going to get your recommended "Walnut That Kissed the Chicken" sandwich at Rutabegorz. And after that all Cafe Lucca, Watson's, et al. I did try Papa Hassan's a few weeks ago though, and I think I may have tried the wrong item. I had the the lamb shawarma and they went a little overboard on the yogurt sauce...too sour. Gotta remember to try the "Heaven" next time -- whatever that may be. How I've missed you Elmo Monster! Wow, Spago's, and OC Weekly, and a meal with Chubby Panda, (oh my)! You've definitely kept busy these last 40 days! As for your OC Weekly nod, I am actually disappointed. The OC Weekly has lost all credibility in my eyes, because Tommy Lasorda ain't even in your league! But they do have something right, you definitely are the "best!" Congratulations on the wonderful accomplishment and well-deserved recognition! Can't wait to see your blog on every "Best of ___" list, as Monster Munching transcends the OC. You have a cult following all over the world--I'm in the Bay Area and you are still my source for inspiration. I had the lamb shawirma @ Papa Hassan's and was unimpressed as well. I don't get the fuss. Although I've joined many a classmate at Papa Hassan's for a little piece of "Heaven." I don't really know what it is either, but it's good. Looks and sounds heavenly! I am very picky about desserts. I love them, but I have high standards. It seems this pie just might meet those standards. Again, great to have you back! And again, thank you for your kind words. Words that I hope I am able to live up to. If there's one thing the OC Weekly thing has made me realize, it is that more people read this blog than I thought! The pressure is on! HAHA! Ahh, Noodle Avenue. I get cravings for that noodle soup of theirs even when the weather is hot (like last week), now that it's cooling down again, those cravings are going to double. Me too. Overly sweet desserts just kills tastebuds. Unfortunately most supermarket pies and cakes are always heavy-handed with the sugar. These pies are exactly right. Just enough sweetness to tantalize and make you want a forkful more than you're given! It sounds like your family is in for a treat regardless. While Filling Station pies are indeed good, a complete turkey dinner from Wild Oats (with a pie no less), sounds awesome! Aaw. Well, you gotta try a slice one of these days if you ever find yourself in Old Towne Orange with a sweet tooth. They have it year-round, I believe. LOVE the Filling Station! The circle has so many great places. Felix's, Watson's Drug store/soada fountain (favorite shoot spot for plenty of movies), a great little greek place on Chapman 2 doors down from the pool hall. My 1st apt. was a bachelor pad right above Felix's! Next time you want a special meal, head up Chapman to the Hobit! Happy eating and I'd love to hook up with everyone next time you meet for lunch! Pretty and pretty tasty too! There's still leftovers in the fridge though. We're going to OD on this stuff for the next few days. Good thing we have plenty of whipped cream! Watson's looks so awesome from the street. Gotta try it. Too bad I was in a hurry Thursday to pick up the pie before The Filling Station closed or else I would stopped and had something there. 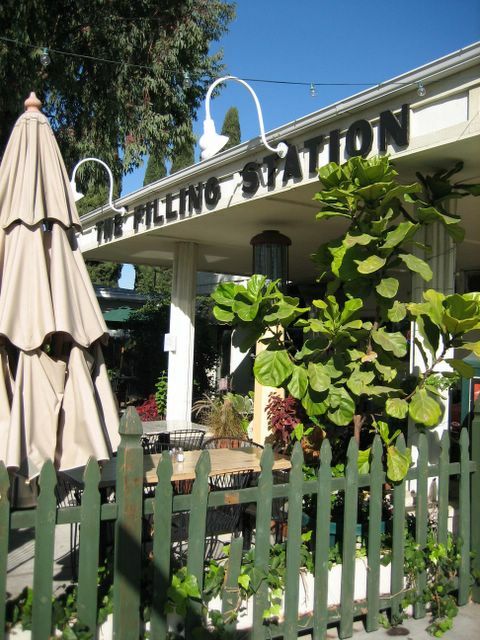 Filling Station has been a restaurant for a very long time. I think they got new owners a few years ago. I happen to love going for breakfast early on the weekends in the warmer months and just chill outside. Papa Hassans is GREAT for APPETIZERS - don't order dinner go for the mezzas approach. My FAV middle eastern in the area now is Meejana's on Tustin across from Big Lots. Great food! I've had Gabbi's twice, horribly overpriced, crappy overly salted...total waste of money - way too many great mexican restaurants in the area skip this place. Best thing about Cafe Luca's??? You can BUY THE GELATO in TAKE HOME sizes! HOW COOL is that! :] I organize a Fibromyalgia group and we eat out alot and Cafe Luca's is always a hit with my meetups! You need to go back there are try some of the food. And my wife and I need to go back there and get one of their pies. We go here almost every weekend for breakfast and we always see their pies but are always too full to get a slice (even to take it home). So now that you praise it I will insist we take home a slice of heaven.